Today was a pretty rough day. I got some news I’ve been hoping to get for some time, and it’s really good news. Almost better than good and it will help my home life a lot. All day at my desk, I fought distraction from my work at hand because what I am working on is proving difficult to learn and even harder to master, yet I must do it to accomplish a goal that I set for the project at work. And to top it all off (not really), I heard that Sally Ride died on the same day that a friend reported on Twitter that her father died unexpectedly. Through all of this I managed to set aside the good news, make some progress on the stuff at work to the point where I might actually accomplish something this week, and yet I found myself quite moved by my friend’s announcement. I kept coming back to it, more than once over the course of the afternoon. Her father died, unexpectedly. They were waiting on finding out whether or not he had cancer. Again. And she lost her mother just over a year ago. This is more than my mind can grasp. And I want to say things about how sorry I am, but I keep getting the impression that I’m focusing on my feelings and what I want to say or do and it just doesn’t seem right. I’ve read that when someone loses a close family member, that it’s not the best thing to say “Let me know if I can help in any way.” The person is not in a state of mind to ask for anything. That sometimes it’s simply better to go over and help. Clean the dishes, mow the lawn, take them out to lunch, or just be there sitting quietly with them. But when that person is a country away and in all honesty you don’t know them that well, what can you do? I find myself circling back to how I would feel if I lost both of my parents and how sad and heartbroken I would be. And I find that’s about all I can do. Sit with that sadness, be with it for my friend. Feel it. Find out what color it is? How does it make me feel physically? What does it smell like? This is the best I can hope to do, I think. I can’t lighten this burden, I can’t take it away, and nor would I want to. As godawful as this is, I wouldn’t do that because this is what makes us who we are. In the end, it comes around to more than sympathy, an honest attempt at approaching empathy for something you’ve never experienced yourself, but know you will one day. Oh, and the rest of the stuff that happened today? It’ll wait until tomorrow. This week was my birthday. A “milestone” birthday that everyone else thinks is significant, but I was not planning on making a big deal of it. I don’t consider it that much of a huge accomplishment to reach the age of 40. It’s not like I did anything except take reasonably good care of myself and not get hit by a bus. My wife, however, had different ideas. On Tuesday, she contacted me at work and asked if I wanted to go to our favorite fast casual restaurant for dinner. Of course, I agreed. It’s tasty and we had a coupon for a free entree. So she picked me up at the Metro and we had dinner and it was nice. 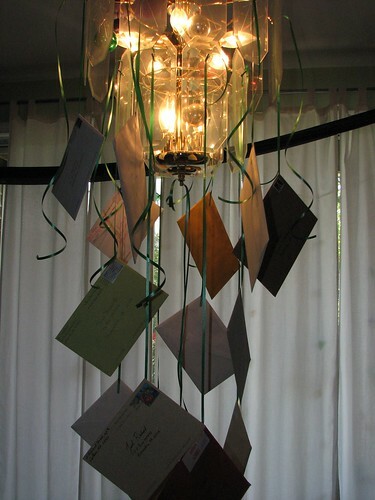 When we got home, I was putting my leftovers in the fridge when I turned around to see a bunch of cards hanging from the chandelier in our dining room. Now, it’s not unknown for my wife to do fun things with stuff like this. I thought she probably just thought it would be fun to spruce things up a bit and hang the cards from ribbons on the chandelier instead of placing them on the top of the piano like we normally do. We have plenty of ribbon that we are unlikely to use anytime soon, and so that was one fun thing to do with it. On the table was a small box, too. And then she brought out a cake. Yay! It’s a little birthday at home. I am content. Then I start looking at the cards and the box more closely. The cards are not from the usual places. I don’t have family in Boston. Or Alabama. And there’s far more than family members. That’s a lot of cards. The box has an airmail sticker on the outside and it’s a bit beat up, as if it went a long way. And it was sent from Australia. Huh? What’s going on here. So I start taking them off of the chandelier and see that they are from all over the place. Some have names, some don’t. I start to realize that there’s been a conspiracy here. My wife has contacted many of our online friends and they have sent cards for my birthday. This is really awesome. People from California, Ohio, Texas, Colorado, Utah, Massachusetts, Oregon, Florida, Alabama and others took the time to find a card, write something nice in it and send it. My wife held onto all of them for days. Oh, and the box from Australia? Chocolate that you can only get there. Cadbury Footy Bites and two, count them, two!, packages of Tim Tams that you can’t get in the U.S. This is awesome! Kate picks me up at the Metro again, we have a doctor’s appointment. In the car is another box! And an Express Mail envelope! These are obviously latecomers, of which we knew we’d have a few. The express mail envelope is surprising. Someone spent almost $20 to send a card for me. Brian, really, you could have waited. I open the express mail envelope and inside is a beat-to-hell wrinkled-up yellow greeting card envelope. Inside is a card and it has a monkey on it. This is not surprising seeing as this is a fellow Jonathan Coulton fan. Then I open the card. And it’s signed by Jonathan Coulton. With an added message “Not enough monkeys!”. This. is. AWESOME! Wow. I am floored. In the box is an equally cool gift. It’s from our friends Tara and Sean in Utah who know I have an affinity for the space program. In the box, along with a lovely card (Tara does have a way with words) and a little space rocket toy. I look at it more closely and it’s a ballpoint pen in the shape of an Ares rocket. And, to top it off, it’s spring loaded and it launches! I can’t wait to open this up. I think I’ll take it to work and keep it on my desk. If someone needs a pen, I’ll say, “Ok, stand back and get ready to catch. 3…2…1… Liftoff!” I tried it this weekend and launching it from the dining room table, it comes within a foot of hitting the top of our 9 foot ceilings. And so I get a second day of birthday excitement and fun. Not much happens on thursday and friday. We’re cleaning house looking forward to a visit from our friends Thera and Josh as they drive back home from the beach. So Thera and Josh arrive. I’m cooking something for my lunch this week. And it’s cooling on the stove when they arrive. At some poing, they remember that they have some stuff in the car that needs to be put into the fridge. I go outside and help get the stuff out of the car, I return to put the stuff in the fridge and as I come out of the kitchen, I see someone in the grass outside out patio and I thought it was workmen or some neighbors or kids walking by. So I look out the window more closely and I see a t-shirt that I recognize from JoCo Cruise Crazy 2 and Molly. The person in the t-shirt ducks behind a wall, but I can still see Molly out there. “I don’t know anything“, he replies.What’s going on here. Why is Molly outside my patio? So I go back outside and Josh is still in the living room, Thera is nowhere to be found, and there are still a dozen nerds on my back porch. I’m shocked and surprised and finally open the door and start letting people in. Suddenly there are a dozen sea monkeys in our condo carrying food and drinks and snacks, salad and cake and all sorts of things. A card is shoved in my hand. A gift bag. A large gift bag. Wow. Needless to say, I’m still shocked and still surprised but I soon realize that our little living room and dining area won’t hold this many people. So I say “Let’s move the couch over here” and like some sort of domestic Transformer, the room is suddenly reconfigured to hold more people. Kate is bringing out chairs and people are settling down and I’m floored. Presents are opened, games are played, cake is eaten, everyone has a good time and I thanked numerous times for getting older and giving everyone a reason to have a party. After all this, Kate asks me some questions about how the day went. And she makes the point that sometimes things are celebrated in ways that you don’t expect it and that sometimes the things you expect aren’t the things you want. And that sometimes things that you don’t want to celebrate should be celebrated anyway because they are important as much as you don’t want to admit it. This week I turned 40 years old. I don’t feel it, people tell me I don’t look it, I hope I don’t act it (except at work). But what really happened is that I got to spend this week with someone who loves me in ways I am still learning about, and I got to celebrate it a second time with an amazing group of friendly, kind, generous and amazing people. Who could ask for more, really? Chicken nuggets taste good. That’s an understatement. They are a marvel of food engineering made to directly push the buttons of the food-desire centers of our brains. They are arguably one of the tastiest things ever invented, and possibly one of the unhealthiest food that one can consume. I just saw an ad on television for Tyson chicken nuggets. And it was, of course, aimed directly at parents and, by extension, their children. There were children in the ad eating them and smiling and I couldn’t help but think to myself, why would any half-nutritionally-conscious parent ever give their child something like that to eat. Sure, they are tasty and easy and there are a myraid of dipping sauces to accompany the golden nuggety goodness, but they are so bad for you! And they are marketing them directly to children! So I comment on this to my wife and she suggest what alternative is there for a parent whose kid won’t eat anything? So I postulated that perhaps the child wouldn’t have acquired a taste for chicken nuggets if the parents hadn’t given them to the child in the first place? And so the topic came up of what did people do when their kids didn’t like what was offered to them before there were chicken nuggets? Invented in the 1950s but first introduced to the American public in 1980, we were raised, for the most part, as children who didn’t know chicken nuggets. What did we eat before then? I guess we ate whatever was put in front of us. Our parents were, for the most part, children of depression-era parents who likely made sure they ate what was available, but as the generations went on, things changed we moved further and further away from that mindset. Now we have super cheap, super-not-very-healthy food choices that may be on sale for $3.99 for a three pound bag of chicken nuggets. It baffles the mind the number of choices we have available to us and yet none of them are terribly healthy for us. I’ve been trying to cook most or all of the food I eat and as much work as that is, I think I do feel better for it. At the least, I can say that I’m taking in fewer chemicals than before. So here’s to making your own food, but sometimes I just crave that golden, delicious chicken nugget. Traditionally, spring has been pretty rough for me, and on some days, it still is. What with all the trees and flowers and grass and plants gettin’ busy. For whatever reason, that particular part of my DNA doesn’t seem to want to tell my body that the pollen isn’t bad for me, or my body continues to think it is. New Tree Growth on an evergreen tree. No, today, its nature in the springtime. I nearly always avoid being outdoors or opening the windows during the high point of spring. Usually it’s the insanely high pollen levels that would reduce me to a sniffling, sneezing, disgusting blob of concentrated unhappy. Thanks to modern medicine (screw you, DNA!) I can do moderately well most days in the spring, with some caveats that I can handle. So I walk to the bus and I walk to work and I stand outside waiting for the metro. And this week, on the way to the bus stop, I saw, for the first time in either my entire life or so many years that I’ve forgotten, I saw a tree growing. Yeah, I know! Crazy, huh? Trees take years to grow! But if you look closely and look at the right time of year, you can watch it happen. Day by day, opening like the petals on a flower, a tree produces its own new sprig of leaves. Once you know what to look for, it’s easy to see, but the evergreens and conifers show it most vividly in that their new growth so brightly contrasts with the old. We’ve had a rainy winter and spring, so the ground is quite saturated. I think that’s contributing to the explosive grown in the trees this year. To be honest, we’re overdue give the dryness of the past couple of years. Even the grass is growing like mad (much to the disapproval of my nose), but it’s good to see. Very good to see. So spring continues and summer will come, but I’m in no hurry. I’m enjoying the show. I’ve always liked the rain. I’m not sure why. Right now there’s quite the light and sound show going on as we get the first real downpour of the year. Except for some snow earlier this winter, we haven’t had a lot of weather come our way lately. Spring around here often brings more rain and more cloudy days, which is to be expected. “April showers bring May flowers,” as the saying goes. But this downpour feels like something wicked that comes in the burning dog days of summer when you know it’s going to cool things off only a bit and what’ll be left is the sticky, swampy humidity of Washington DC in summer. I think I like rain because, at least in my mind, it would be the only thing that could give relief to my allergies (at least until the modern pharmaceutical industry came around) but I’m really not sure. It’s definitely fun to go play in the rain, but I certainly would do it around here, what with the giant high-voltage electrical tower (read: lightning rod) about 30 yards from my home. I seem to remember playing in the rain as a kid. At least I like to think I did. I remember many things from my childhood, but that’s not one of them. I do recall one day, it must have been in the first grade, and it was time to go home and there was a big storm headed our way. It wasn’t a hurricane, that’s for sure, even though they were common in south Louisiana growing up. But it was not your run-of-the mill rain-shower, either. It must have been three in the afternoon, but the sky was dark like it is after sunset. And the rain was coming down hard. I remember the covered walkways we had between buildings. The water would pool up in certain places under those walkways, so it was either get your feet wet or get your head soaked. I must have run through that to get to the bus, but I don’t remember that. I have this image of the dark skies and the pouring rain and the puddle of water where the concrete was not quite level. One of the things I miss most about rain is the lack of certain sounds when living in a condo. There are two stories above me and I no longer get to hear the rain on the roof, a calming, comforting sound if ever there was one. I have to content myself with the pluck-pluck-pluck of the water dripping on the downspout outside the window and the sound of the rain on gardens and sidewalk, cars and concrete. Still, though, there’s nothing like a good thunderstorm. If this keeps up any longer, they’ll be calling for flood warnings down by the river tomorrow morning. Another huge flash-boom. The storm sounds like it’s right on top of us, but there are still echos of thunder a ways off. I hope this lasts all night… I’ll sleep like a baby if it does.